Coming into Round 2, Andrew held a 5-3 advantage. We both picked Hillsdale, Northwestern, Norwayne and Northwestern, so we both had two correct picks and two incorrect picks. Nobody picked a margin correct or the exact score, so Andrew has 7 points, and I have 5 going into round 3. I'll say this for Andrew, he labored on the Triway vs. Northwestern pick. Took guts to put his basketball knowledge over backing your alma mater, and he's a pretty big Triway fan. Even though he picked Northwestern, I doubt you'll see him losing any sleep over it. Tim: This is meeting #2 on the season between these two schools. The first meeting was back in December at the Smitty Classic. Plain and simple, that was embarrassing. Hillsdale ran Orrville off the court and the Riders played with way too much emotion leading to lots of poor decisions and easy baskets for Hillsdale. I'd like to think we've improved since then and think Coach Slaughter has ironed out his rotations too. But after watching Hillsdale dismantle Loudonville, it may not matter. That's a good basketball team with the right parts in the right places. Tim: No offense to either team, but I sincerely doubt anyone had these two picked to play for a spot in the district final. All Wellington has done is defeat two WCAL teams in the first two rounds, and Triway knocked off the #2 seed in Northwestern and held the districts "best player" to half his season average. I'm sure both teams are thinking "Why not us," and why not indeed. I have no idea who Wellington is, or what they do well, but they've surprised me twice, and have just as good a shot to do it a third time. Triway is deceiving in that they have some solid athletes in Carmichael, Polen, Grenert & Wharton...and the win over Northwestern has them flying high. Don't look at record for either of these teams. I think they ride that wave into the district finals. Tim's Pick: Triway 66 - Wellington 59. 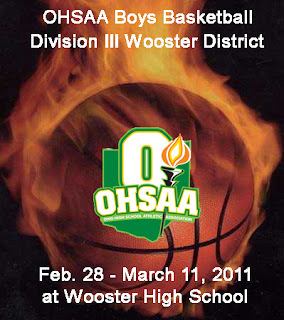 Wouldn't it be something if Triway and Orrville met up for the district finals again? One year after surprising nobody by making the finals last year, they'd surprise everyone by doing it again in 2011.